This page has been paraphrased from the pamphlet, “St. John the Baptist, Eversholt – a brief introduction”, published in July 1991. The pamphlet was discovered among a bundle of papers unearthed by Anna Blomfield. The pamphlet is still in copyright so isn’t reproduced in full here. 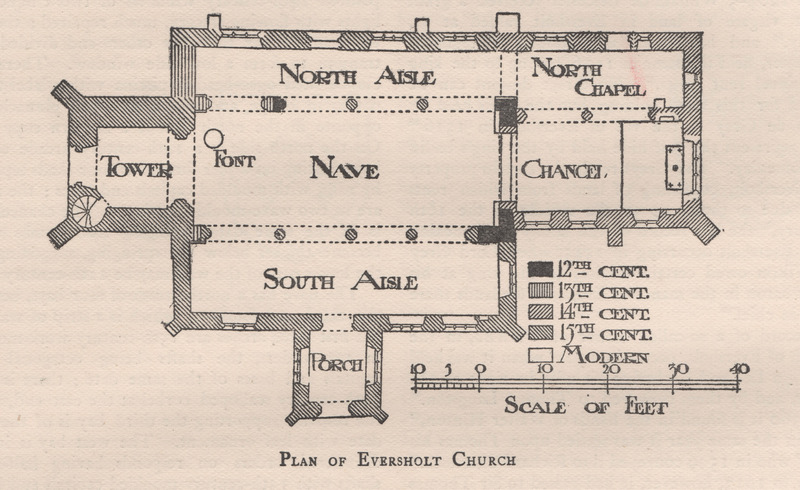 However, the plan of the church from that pamphlet turns out to have been copied from A History of Bedfordshire, published in 1912 and out of copyright, and a scan of that 1912 plan is reproduced below and placed in the public domain (click for a bigger version). This article will be expanded with more plans and pictures in the future. Nave The main, tall section of the church where most of the congregation sit – the bit the bride walks down! North Aisle and South Aisle The less tall sections of the church to either side of the nave. Looking towards the altar, the North Aisle is on the left, and the South Aisle is on the right. North Chapel The small room on the left of the chancel, looking towards the altar. This is nowadays used as a vestry, a storage room. Memorial Chapel The eastern part of the south aisle, towards the altar, which is dedicated to those who died in wars. Tower The tower! At the west end of the nave. Clerestory (pronounced clear-story) The upper part of the double-height nave, where windows are let in to the sides of the tall part of the building. Font The large stone basin on legs at the tower end of the nave, used for baptisms. Porch The covered walkway outside the church that leads to the south door. The 1991 pamphlet doesn’t tell where its information comes from, but it’s true that experts can tell the building period of a church just by looking at it. There may also be records of building in church archives. Various sources seem to agree on the sequence of works, but it’s not clear that they’re not just copying one another! So take this lot with a pinch of salt. The church was first built about 1180. It was much smaller than today. The chancel arch was always in its present position, and the stonework at the bottom of the chancel arch, left and right of the archway, is thought to be original, set there around 1180. The nave was shorter, about 10 metres long instead of the 14 it is today. There was no tower, south aisle or north chapel, but the north aisle was present, and the chancel. The nave was single-height, not double-height as it is now. 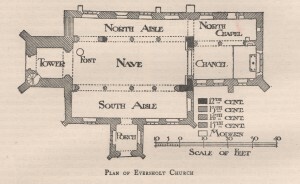 In 1230, the nave and the north aisle were extended (away from the chancel arch) to the length they are today. Originally, there were just three arches between the nave and the north aisle. After this extension, there were the four arches that are present today. The font dates from sometime between 1200 and 1300. About 1330, the chancel was rebuilt, to its current size. It’s not clear how big it was before this date. At the same time, the north chapel was added. Originally, the north chapel wasn’t walled off as it is now, but was separated from the chancel by two archways. The 1991 pamphlet says, “The three windows on the south side of the Chancel are 14th century”, but it’s not clear whether it means the stone framing of the windows was built before 1400, or the stained glass is from before 1400. Between 1400 and 1500, the tower, the south aisle and the porch were added. The clerestory was built to make the nave double height, and the archways between the nave and the north aisle rebuilt. Since this time, the overall shape and size of the church hasn’t changed much. So, it looks now more or less as it did five or six hundred years ago. Major work was undertaken about 1870, when the whole church was refurbished according to a design by Sir George Gilbert Scott. This work remains controversial, and there are people in the village today who dislike the changes made, but it’s not clear on what grounds. Most of the woodwork in the church dates from this time. In 1890, the church clock was installed. From 1985 to 1986, the wooden screen around the meeting room was extended. Before this time, it enclosed a smaller portion of the south aisle at the tower end. The memorial chapel was created. In 1986, a group of “Friends of St. John the Baptist” was formed to raise money for church upkeep. In 1988, “the ladies of the village” made the one hundred splendid tapestry kneelers that are in use today. In 1989, Harry Jaye, who lived at Church Farm, modified the church clock by adding an electric winder. Before this time, someone had to climb the steps of the tower and wind up the clock. In 1989 and 1990, the stonework around the south side windows was repaired. The new stones are clearly visible today. In 1991, four windows on the north side of the clerestory were repaired. There is a perennial problem with thieves climbing the church to steal lead from the roof. This is a singularly pointless exercise, since the lead was long ago (after a previous theft) replaced with steel which is not worth the carrying away. However, metal thieves seem not to be the brightest sparks, since they have damaged the roof several times in recent years. The striking interior decoration of the church is by Edward Aveling Green. He was an accomplished artist and craftsman who lived in the village from around 1900 until he died in 1930. Again, his work is controversial, with some people liking it very much and others wishing it were otherwise. In 1905, he designed and constructed the stained glass of the east window, the window above the altar. In 1908, he designed and carved the reredos, the beautiful sculpture of the last supper which stands today behind the altar. It was made using wood from the seats of the Sunday School. In 1910, he painted the chancel arch (actually it’s a canvas that hangs on the chancel arch) and the six round medallions of saints in the nave. At some date, he designed and carved two oak chests, one in the current vestry, and one “in front of the north window”, although quite where is a mystery. He also designed and carved the wooden statue of St John the Baptist, using an old gatepost from Linden. In 1922, he made his last gift to the church, the statue of Saint Michael which stands on the war memorial.